In 1907, the federal government declared that any American woman marrying a foreigner had to assume the nationality of her husband, and thereby denationalized thousands of American women. 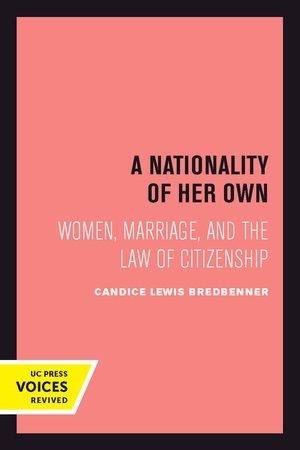 This highly original study follows the dramatic variations in women's nationality rights, citizenship law, and immigration policy in the United States during the late Progressive and interwar years, placing the history and impact of "derivative citizenship" within the broad context of the women's suffrage movement. Making impressive use of primary sources, and utilizing original documents from many leading women's reform organizations, government agencies, Congressional hearings, and federal litigation involving women's naturalization and expatriation, Candice Bredbenner provides a refreshing contemporary feminist perspective on key historical, political, and legal debates relating to citizenship, nationality, political empowerment, and their implications for women's legal status in the United States. This fascinating and well-constructed account contributes profoundly to an important but little-understood aspect of the women's rights movement in twentieth-century America. Candice Lewis Bredbenner is Associate Professor and Undergraduate Coordinator in the Department of History at University of North Carolina Wilmington.